In Time & Place is a growing library of teaching materials for classroom, distance, or home use focusing on selected topics in American history. You will find many traditional reading, map, and photo related resources, but you will also find GIS (Geographic Information System) data and activities as well. All of the materials can be used individually or as a whole to build a unit on each topic in a way that best suits your and your students' needs. There are suggestions in some cases that the materials are well suited to group work or jigsaw type sharing activities. But these are not pre-packaged lessons; rather collections of resources that you can adapt to your style and specific classroom needs. Students are able to put the events involved firmly in place as well as time. They are able to investigate and analyze large amounts of place related data - giving an entirely new avenue for understanding historical events. GIS software gives students another medium for developing both critical thinking skills and spatial literacy. 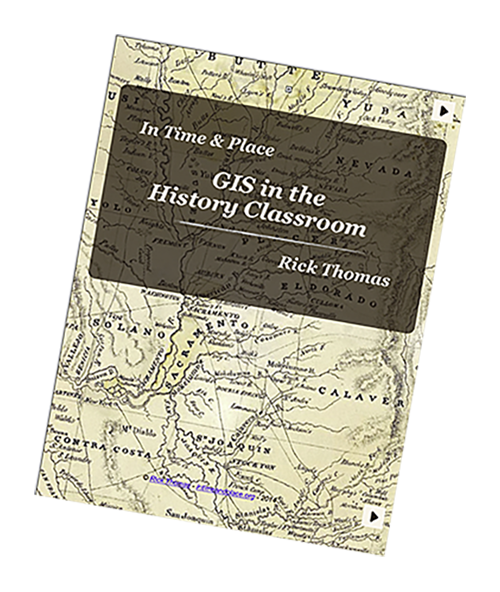 In Time & Place: GIS in the History Classroom is a guide for middle and secondary history teachers to the use of geographic information system (GIS) software in their classrooms. and technical issues related to developing materials for students. Discussion throughout includes sample lessons that enable readers to see how GIS might be integrated into their own plans along with a variety of other, more traditional and familiar historical resources. Slide presentations are included that both illustrate the text and can be used as part of inservice presentations. A bibliography of additional resources is available along with references to the research cited. East of the Cascades is an anthology of writings about Oregon east of the Cascade Mountains - its landscape and the life it promised - taken from sources as varied as legends of native American settlers to more recent considerations of the human role in the ecology of the state's most wild places. In addition, it is a collection of photographs - contemporary reflections of the landscapes chronicled by the collected authors. As such the anthology can be engaged on two levels: contemporary landscape photography and social history. The landscape of Oregon east of the Cascades is amazingly beautiful and diverse - very easy to enjoy in its own right. And the variety of historical points of view expressed here is as varied and rich as the landscape itself. Over three million people - more than one third of the country's population - died or emigrated from Ireland as a result of the potato famine of the late 1840s - early 1850s. Materials in this unit provide background into the famine itself including its cause, efforts by the British government to deal with it, its cultural and demographic impact, and the emigration from Ireland and the immigration of over one million Irish into the United States. 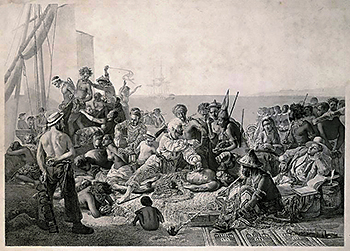 It is estimated that over twelve million individuals were forced into slavery from African ports between 1501 and 1867. Approximately two and a half million men, women, and children died in the "middle passage" aboard ships bound for the Americas. By 1820 almost eighty percent of the population of the new world had been forced to emigrate from Africa. In the early 1800s the growth of the cotton and sugar economies within the United States saw both a growing black market for slaves from the Caribbean and an overland trade in slaves from the southern Atlantic States. Materials in this unit provide insight into these forced migrations from a variety of perspectives including that of slaves and slave traders. In the early 1800's the basic policy of the United States government regarding native Americans was to remove the Indian population from areas, or potential areas, of white settlement. The most thoroughly documented instance of this policy and its consequences is the removal of the Cherokee Indians from their homelands in the southeastern states of Tennessee, Alabama, North Carolina, and Georgia. 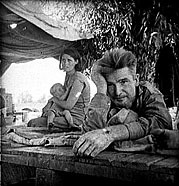 Materials in this unit focus on this episode in U.S. history. They provide background on Cherokee culture, the national debate over Indian removal, and accounts of the Trial of Tears itself. Past human behavior and use of the environment in which we live has had a dramatic affect on how we live our lives today just as our use today will help shape the lives of future generations. This unit focuses on broad issues of land use in the Mother Lode region of California. You will examine the historical impact of native American practices and the effects of mining, forestry, agriculture, and the changing demographics in the region. You will study historical documents including letters, diaries, magazine articles, photos, paintings, and maps that will allow you to see how the region's geography has been altered and effected by human interaction. The "national park" idea was born in 1864 when the U.S. Congress granted Yosemite Valley to the state of California to "be held for public use, resort, and recreation; ... inalienable for all time." The materials included here provide an insight into the impressions held by the first visitors to the park, early business people, and by those who fought to preserve the place. 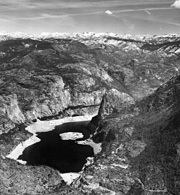 The early 20th century battle to dam the Hetch Hetchy Valley in Yosemite National Park was national in scope and pitted two sides of the country's new conservation movement against one another. Preservationists, led by John Muir, argued against the dam, Utilitarians, led by Gifford Pinchot, creator of the nation's Forest Service, argued for the dam. The materials in this unit allow students to explore over a century of American ideas about the natural environment, the geology and geography of Hetch Hetchy Valley, its early history, the controversy to build the dam, and, finally, to examine the impact of breaching the dam today. The movement of African Americans from the rural South to the urban North in the first three decades of the 20th century is one of the most significant mass migrations in the nation's history. The materials include primary and secondary sources as well as detailed demographic data. 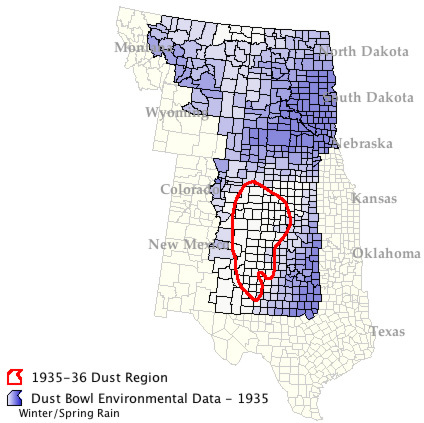 The traditional story of the Dust Bowl focuses on the agricultural practices of settlers in a foreign environment. Recent accounts look more closely at climate as the most significant factor in this story. Students will get a chance to explore the issue from both points of view. 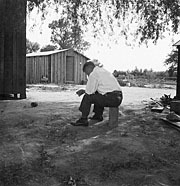 The internment of Japanese Americans during World War II represents the degree to which racial and cultural intolerance can be carried when mixed with the fear and hysteria of war. The history of the event represented in the documents and activities here is at once a story of immigration, significant constitutional issues, racial discrimination, and the lengthy amalgamation of cultures. The Hanford Nuclear Facility had its origins during World War II as part of the Manhattan Project, the United States effort to build an atomic bomb. The reactors at this isolated site in south central Washington state were built to produce plutonium for two of the first three atomic bombs. The success of the project at Hanford came with a price, though. Radioactive gases blew from the reactor stacks and water containing radioactive materials flowed back into the Columbia River after cooling the reactor cores and seeped from various sources into the Hanford soils. The result for many "downwinders" has been a lifetime of radiation related health issues. Each unit includes a For the Teacher page that identifies unit objectives, related national social studies and geography standards, references to GIS data sources, and a short bibliography of additional resources. The materials found in each unit are largely primary sources. As such, the reading level of individual pieces varies dramatically. Many are well suited for average middle school students; a few will be difficult for the best high school readers. In part, the difficulty lies in the use of arcane 18th and 19th century language, longer sentences with more complex structure than is commonly used today, and vocabulary that has changed meaning. Encourage the use of an online dictionary when reading. Be selective. In mixed ability classes not all students have to read the same materials, but all can share their understanding of what they have read as part of class discussion. Challenge students. Reading levels improve with practice with more difficult pieces. GIS assignments are an integral part of the materials in this collection. As you will note in the table below all activities can be done online using ArcGIS Online, an internet software that runs on most browsers. Files are also available for download into ArcGIS Desktop. There is Map Help related to each GIS activity that includes specific instructions for using the various features of the software needed to complete the activity. Computer activities such as the use of GIS that are new to students are best completed in groups of two or three following whole class demonstration. I would recommend that you use a video projector to talk through specific software procedures and, more importantly, that you preview the types of analysis in which students will be involved prior to work in a lab. See In the Classroom: Teaching with GIS for a detailed example. Your comments and suggestion about these materials are more than welcome. If you have ideas for additional topics that would lend themselves to the approach taken here, please pass them along. I'd enjoy collaborating with you.